Conference participants will receive a great book, “Fearless Farm Finances” as our gift for attending this year’s event! This one-day gathering takes place simultaneously at locations throughout Alaska, Idaho, Montana, Oregon and Washington. ON-SITE REGISTRATION FEE ON THE DAY OF THE EVENT IS $35, BUT MEALS WILL NOT BE AVAILABLE. Please plan accordingly. For scholarship information, contact Margaret Viebrock at viebrock@wsu.edu. to achieve goals and manage risk. 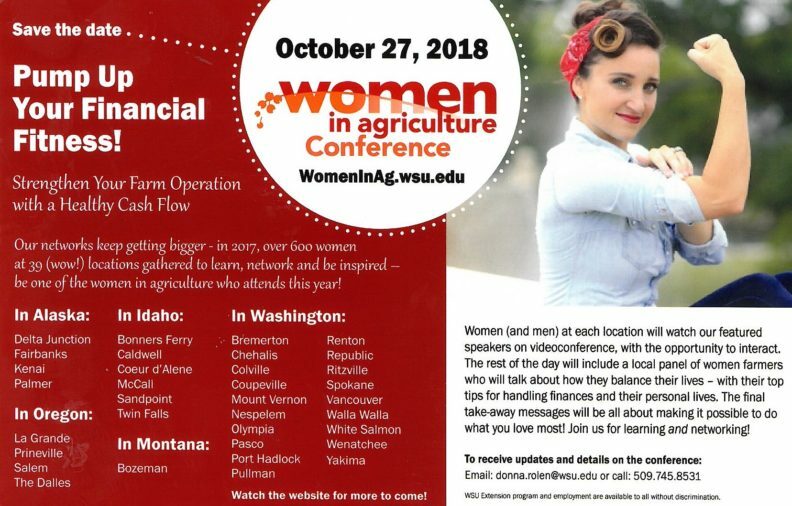 Please email donna.rolen@wsu.edu to be added to the Women in Ag listserv. If you need financial assistance, please contact us at Viebrock@wsu.edu. Kansas State University Ext. Kansas State University Ext. Robin was raised on a family farm and now as a farm economist, she helps farmers understand farm financial management. She knows the importance of sound recordkeeping. LaVell is a third generation farmer and helps farmers analyze their businesses and make decisions based on their farm financials. Together, Robin and LaVell help build and improve annual cash flow systems. They teach strategies to start projections for the next year, monitor cash flow against actual income and manage family living expenses. Sarah Beth and her husband raise cattle in Indiana and as an entrepreneur launched a retail meat business. Her mission as a farmer and agricultural business consultant is to help women be successful and profitable doing “what they love the most.” She teaches new ways to prioritize and how to do the most important things first. She gives her audience “fresh facts” from research that prove the distinct value women bring to the farm. She encourages women to farm! 3:30 p.m. Conference Ends! Enjoy your farms and businesses with a fresh look at finance. Move forward and do what you love the most!